Whether you believe in them or not, whether you call them resolutions, commitments, affirmations, intentions or whatever… they can, and have, worked for thousands of people across borders – why not make them work for you? First get clear on what your ‘it’ is – is it something your that gets you jazzed and excited or just something you feel you should do? I’ll tell you right now that The Shoulds are very unlikely to make it to February but the jazzy ones – now you’ve got hope! To tell or not to tell – People often ask me, should I tell other people about my commitment – to which I answer yes and no. Yes, tell encouraging, motivated, positive, supportive people who will help you. No, do not tell people who are negative, unsupportive or the jealous type. Break your commitment down into small manageable chunks, a little of something is better than a whole lot of nothing. Reward yourself for small successes and preserver even after setback. Like ‘em or not, resolutions, commitments, intentions are here to stay and are one more way you can live Your Life, Unlimted. Ravi Tangri shares an amazing customer service/Cinderella story. Ravi also talks about creating a vision that makes you feel nervous & excited (they share the same physiology). When you have done that you know you are onto something! Crazy nervous and crazy excitement… when is the last time you felt those two feelings in tandem? 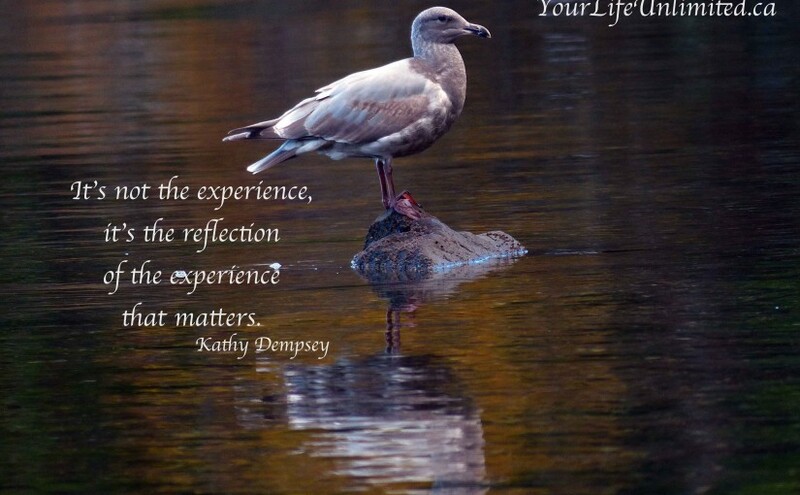 Kathy Dempsey says, it’s not the experience, it’s the reflection of the experience that matters. Spend some time in quite reflection, give yourself time for discernment, ask yourself what brings you joy and then ask yourself how you can get more of that! This entry was posted in Blog, Empowerment, Happiness, Motivation and tagged great ideas, Inspiration, personal growth, podcast, Stephanie Staples, Your Life Unlimited. Bookmark the permalink. Previous Previous post: GROW into it! Next Next post: Crazy, Busy, Nuts!